2007 was the one hundredth anniversary of the opening of the first regular commercial transatlantic wireless service. 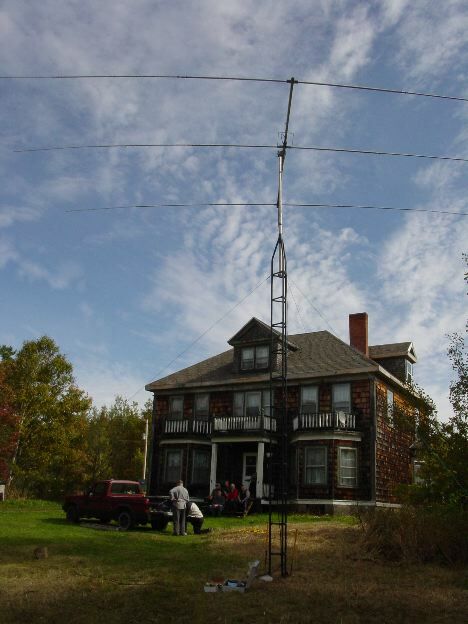 This service was established by the famous radio pioneer Guglielmo Marconi and his company between powerful long wave stations at Clifden Ireland and near Glace Bay, Nova Scotia. The latter station became known locally as �Marconi Towers�. 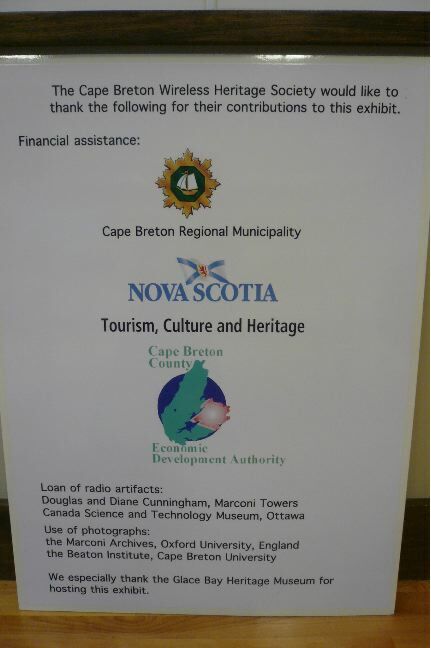 The Cape Breton Wireless Heritage Society marked this communications milestone with an exhibit of historic photographs and early radio artifacts in the Glace Bay Heritage Museum, posters in Glace Bay and Sydney, and commemorative transatlantic radio transmissions on October 17, one hundred years after the opening of the transatlantic service. The radio transmissions were made between the original station sites at Clifden and Marconi Towers. 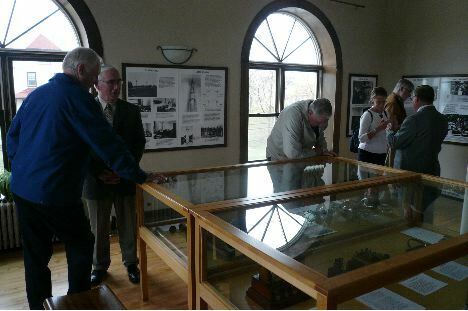 The exhibit was displayed in a light and airy room in the recently refurbished Glace Bay Heritage Museum, located in the former Town Hall building. 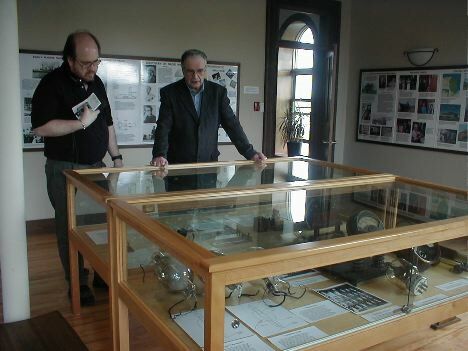 The exhibit consists of twenty panels of historic photographs and explanatory text around the walls, and radio artifacts of the Marconi era in showcases in the middle of the room. The exhibit opened June 1, 2007, and will continue in 2008. Photographs of the exhibit are shown below. 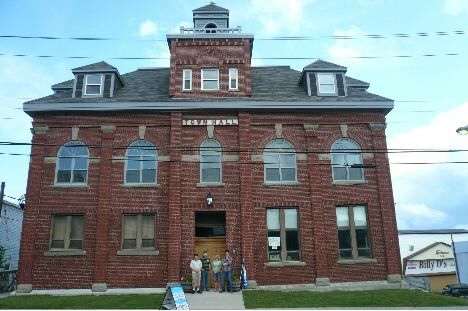 The Glace Bay Heritage Museum, formerly the Town Hall. It was built in 1901, about the time of the incorporation of Glace Bay. Summer assistants at the Glace Bay Heritage Museum. 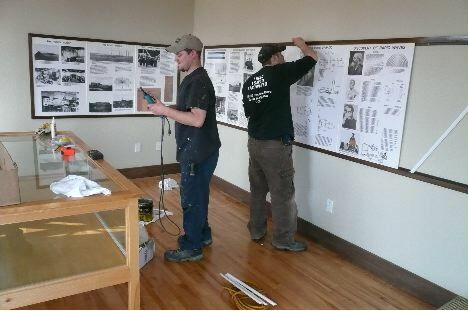 Carpenters installing the panels of photographs and their frames. 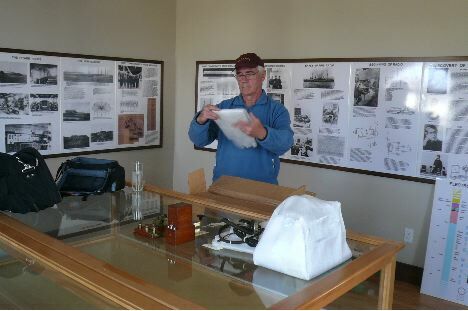 Jim Kelly, Secretary of the Cape Breton Wireless Heritage Society, opening a crate of early radio artifacts lent by the Canada Science and Technology Museum in Ottawa. The completed exhibit. 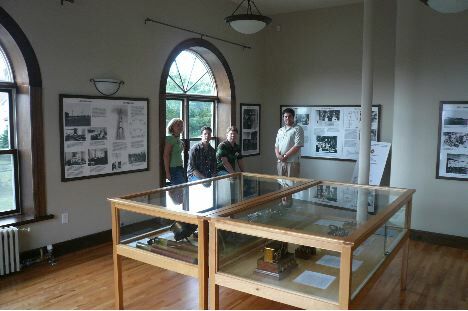 Twenty panels are on the walls around the room and early radio artifacts are in the display cases. Howard MacKinnon, right, Vice Chairman of the Cape Breton Wireless Heritage Society discusses the exhibit with Ron Neville of Coastal Radio. A wireless telegraph key, vintage 1923, lent by the Canada Science and Technology Museum. A Wheatstone transmitter, lent by the Canada Science and Technology Museum, Ottawa. The �Wheatstone� converted Morse code messages fed into it on a punched paper tape into rapid Morse code in electrical form for wireless transmission to Ireland. The chain hanging down was for weights that drove the mechanism. A Brown relay, lent by the Canada Science and Technology Museum in Ottawa. This instrument was an ingenious electromechanical audio amplifier that was used before vacuum tubes were introduced to the transatlantic stations. It worked somewhat on the principle of an earphone feeding sound into a carbon microphone, the two sharing a common diaphragm. There were three Brown relays at the Louisbourg receiving station which could be connected in cascade. It was said that when they were used, the signals from Ireland could be heard with the headphones resting on the table. 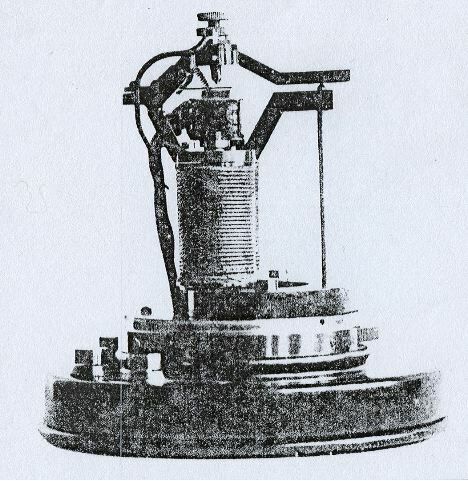 The strong received signal enabled the rapid Morse code produced by a Wheatstone transmitter (preceding photo) to be recorded acoustically on cylindrical records for later transcription by an operator. 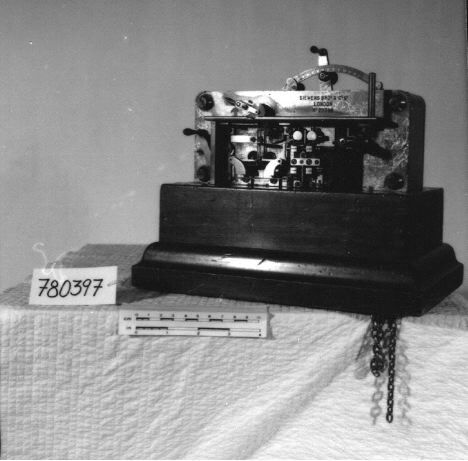 The combination of the Wheatstone Transmitter at the transmitting station and Brown relays at the receiving station permitted Morse code messages to be transmitted across the Atlantic at up to eighty words per minute. The records of the received signals were played back slowly and copied by an operator. 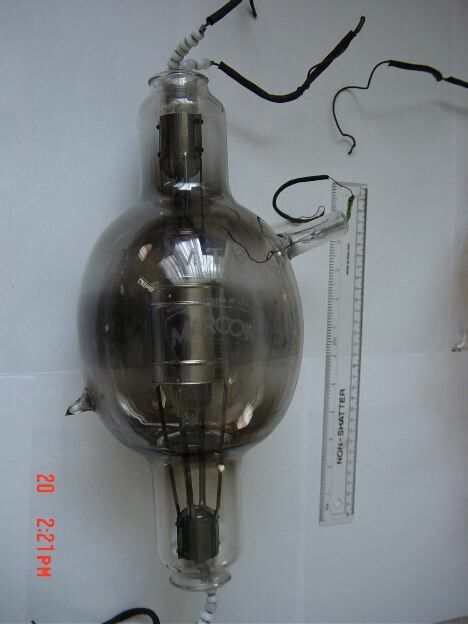 A vacuum triode, vintage 1920, from the Marconi Towers transmitter. Note the control grid wire projecting from the side of the tube. Banks of these tubes generated a continuous carrier wave, and replaced the spark in the transmitter. Banks of rectifier tubes that looked similar, except for the absence of the control grid, supplied direct current to the transmitter tubes. 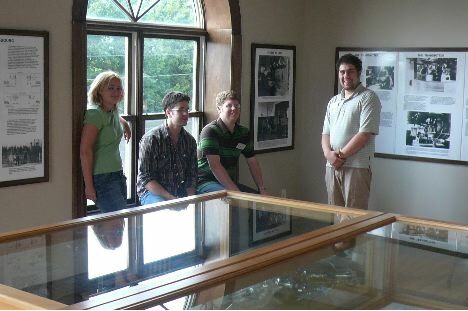 Opening of the exhibit, June 1, 2007. Opening day, June 1, 2007. 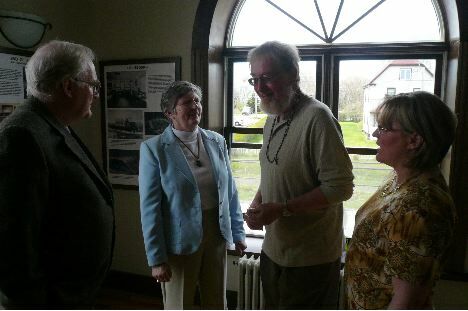 Left to right: Henry Bradford, Chairman of the Cape Breton Wireless Heritage Society; Dr. Mary K. MacLeod, author of �Whisper In The Air, Marconi - The Canada Years�, 1902-1946; Douglas Cunningham and his wife Diane. The Cunninghams live in the house that was the residence of Marconi and his wife, Beatrice, circa 1905-1907. Opening day, June 1, 2007. 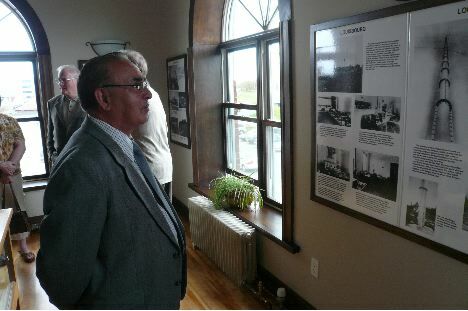 Leandro D�Addario, a member of the Board of the Cape Breton Wireless Heritage Society, looks at a panel. Opening day, June 1, 2007. Peyton Chisholm of Sydney chats with Allister MacDonald of Louisbourg. Both men are keenly interested in Cape Breton heritage. Opening day, June 1, 2007. Left to right: John and Pat Johnston of Little Bras d�Or, Henry Bradford. Opening day, June 1, 2007. 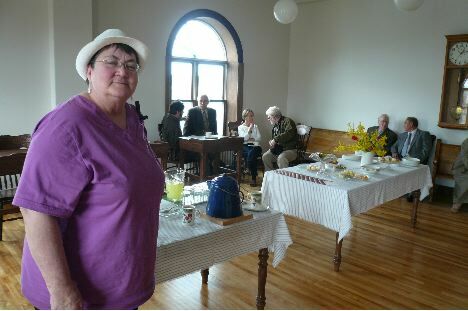 Pauline Thompson, President of the Iona Connection, and others, enjoying refreshments after the official opening of the exhibit. Opening day June 1, 2007. 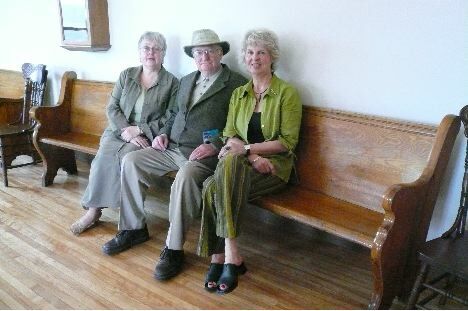 Left to right: Isobelle Harris, Henry Bradford, Elke Ibrahim. 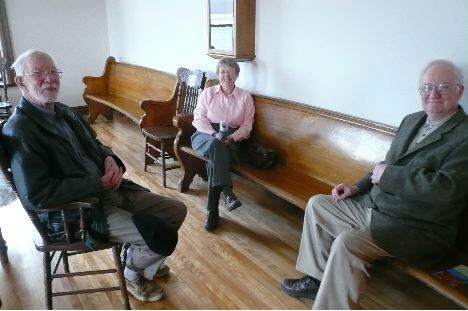 Isobelle and Elke are curators of the Glace Bay Heritage Museum. Panel thanking the people and institutions who made the exhibit possible. The 20 metre wavelength antenna at the Marconi Towers station site used for the communications with Clifden, Ireland, on October 17, 2007. The house behind it is the home of Douglas and Diane Cunningham and their family. It was the residence of Marconi and his new bride Beatrice, and his chief engineer, Richard Vyvyan and his wife circa 1905-1907 while the station was built and tested. 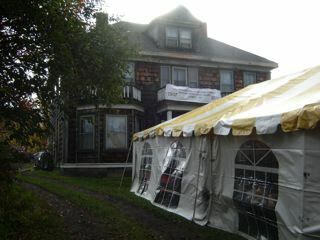 The tent that housed the radio equipment and spectators on October 17, 2007. Report of the commemorative transatlantic radio transmissions in the Cape Breton Post. 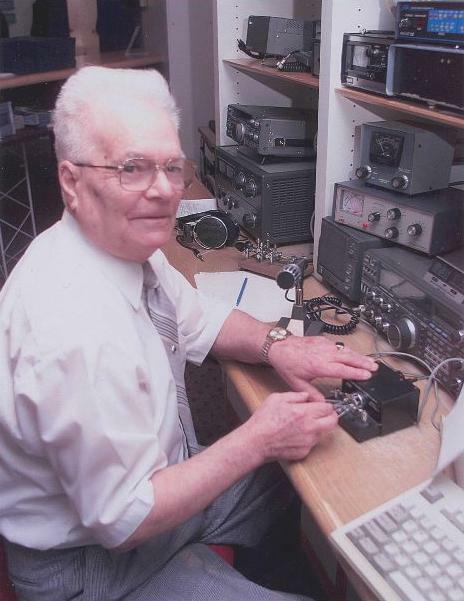 Mike Butler of the Sydney Amateur Radio Club listens to the Morse code signal and writes down the greeting from the President of Ireland to the Governor General of Canada. The commemorative greeting fom the President of Ireland to the Governor General of Canada. The message was copied onto the type of form used by the Marconi transatlantic service. 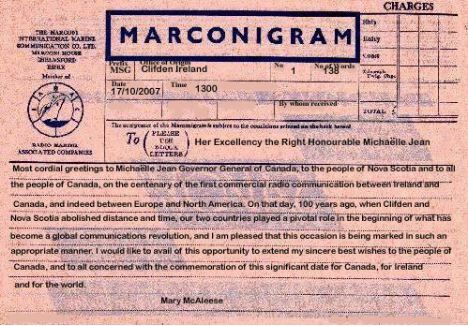 The commemorative message from the Governor General of Canada to the President of Ireland. 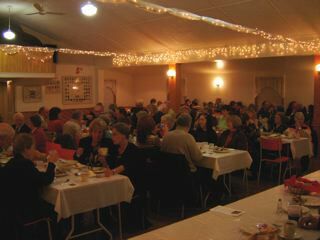 The dinner for participants in the October 17 events, held in the evening at the Italian Community Hall in Dominion, near Glace Bay. Henry Bradford and Ita Kane-Wilson at the dinner. Ita was producing a documentary on the centenary events for Irish radio. The centenary was celebrated in Clifden by an impressive schedule of events from October 12 to 17. The celebrations were opened officially by Minister Eamonn O�Cuiv and Princess Elettra, Marconi�s daughter. Events included guided walks, lunchtime lectures, concerts of operatic music and traditional Irish, Italian, Canadian, American and reggae music, a ball, a vintage car rally, films and several exhibits. 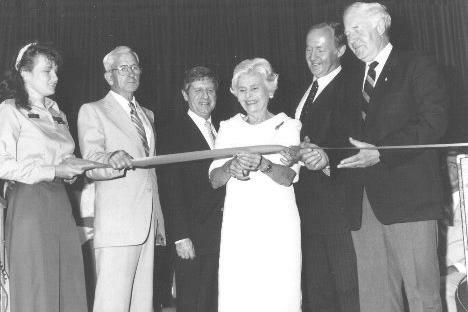 Ribbon cutting at the opening of the interpretive centre at the Marconi National Historic Site at Table Head in Glace Bay in 1989. Left to right: K. Turnbull, Donald MacInnis (Mayor of Glace Bay), Judge Rene Martin (Marconi Celebration Trust), Gioia Marconi-Braga (Marconi's second daughter), Elmer MacKay (Member of Parliament), and John Buchanan (Premier of Nova Scotia). 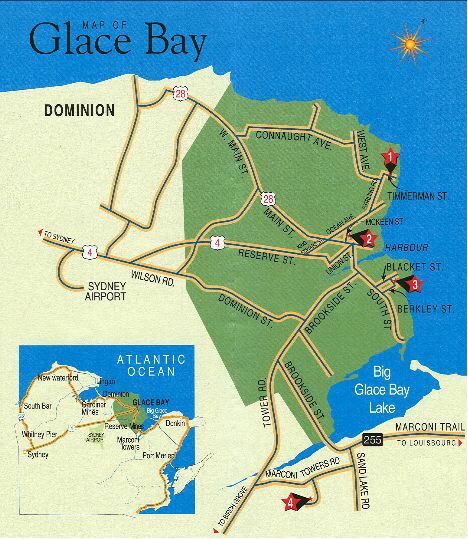 Also on this occasion, Premier Buchanan officially named the coastal road between Glace Bay and Louisbourg "the Marconi Trail". 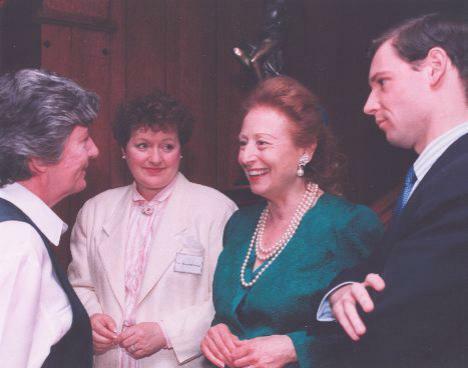 Princess Elettra Marconi-Giovanelli, Marconi's daughter by his second marriage, with her son Guglielmo, talking with Dr. Mary K. MacLeod (left), while Margaret Glabay, owner of the Rockinghorse Inn in Sydney looks on. Princess Elettra and Guglielmo toured Sydney and Glace Bay in 1995. 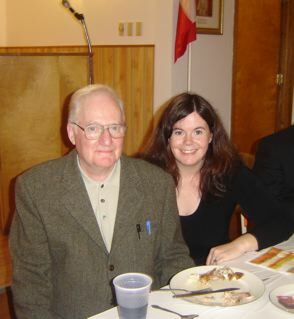 Dr. MacLeod is the author of the book "Whisper In The Air, Marconi, The Canada Years". 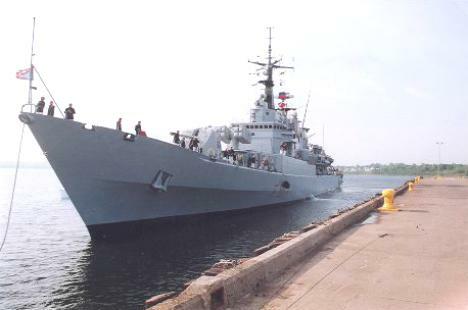 The Italian naval ship Zeffiro visited Sydney, Nova Scotia in 1995 on a tour of east coast ports to celebrate the centennial of Marconi's demonstration of wireless communications in 1895. The Zeffiro carried an exhibit of photographs and artifacts of Marconi's early experiments. 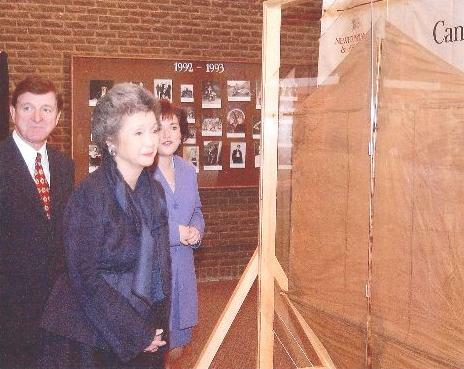 Governor General of Canada, Adrienne Clarkson, inspects a kite used by Marconi to support the receiving aerial wire used in his transatlantic wireless experiment in 1901. Her visit was during the closing events at St. John's, Newfoundland, on December 12, 2001 of the centennial celebrations called "Receiving The World". Behind her are Roger Grimes, Premier of Newfoundland, and Patti Bannister of the Newfoundland Archives. 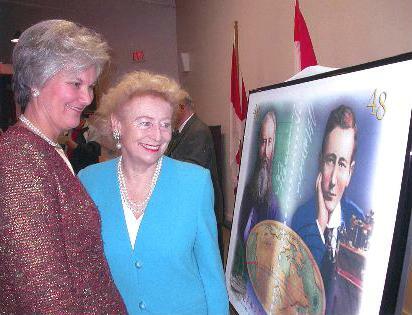 Lieutenant Governor Myra Freeman (left) and Princess Elettra Marconi-Giovanelli, Marconi's daughter, admire a poster of a Canadian stamp commemorating the centennials of the first transatlantic wireless messages and the completion of the trans-Pacific telegraph cable. 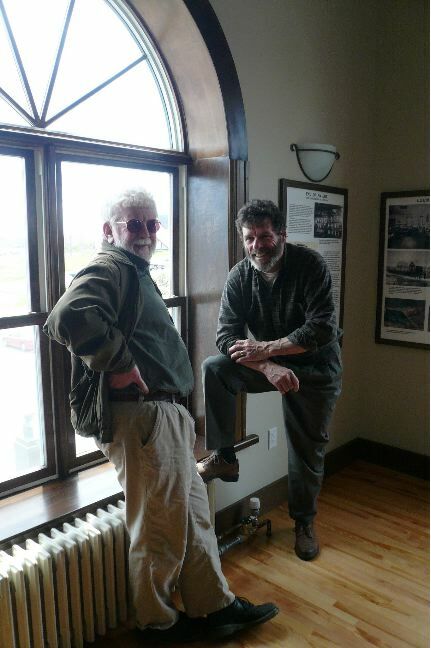 The stamp launching was held at the Cape Breton Miners Museum in Glace Bay, December 15, 2002. 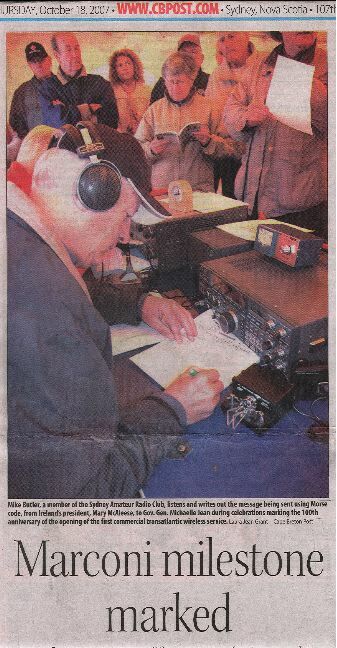 Bill Appleton of Sydney's amateur radio club transmits a commemorative message to Poldhu, Cornwall on December 15, 2002, one hundred years after Marconi's first official transatlantic wireless telegraph message.